Let’s give some props to these guys who’ve already done the work to create an amazing Halloween costume. I think you’ll agree: they look just like our favorite meth-cooking Chemistry teacher. Nicely done. 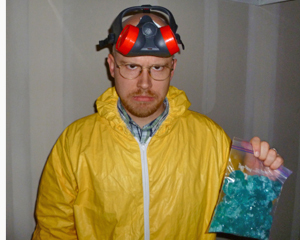 Combining the meth cook hazmat suit, the checked shirt, Walt glasses, goatee, and even some fake blue meth! Real People dressed like Walter White voted 4.1 out of 5 based on 149 votes from voyeurs just like YOU! Ah man that last guy is a classic – kind of scary tho – in a good way lol! W White on What Kind of Sunglasses Does Walter White Wear?